I redesigned my site. Whew! 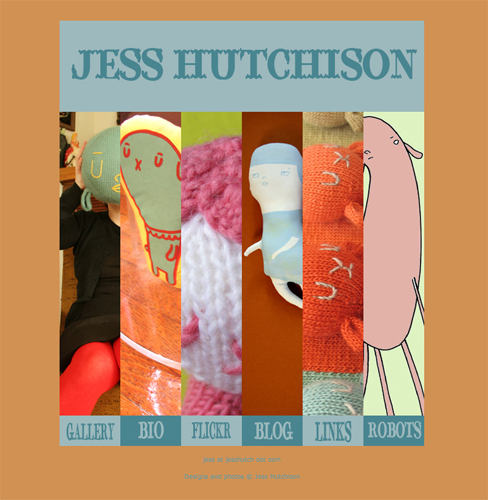 Let me know what you think - and if you see any crazy weird stuff, please email me (jess [at] jesshutch [dot] com). Thank you. I'm going to go eat some soup now. It seems to work as fabulously as it looks! Looks great, Jess! And everything that I clicked on seemed to be working just fine. I consider myself to be a regular reader but I found a couple of images, while looking at your redesign, that I hadn't seen before...love the snake, for example! it looks awesome! I love seeing all the images together. . .
nice! very "cute" and "trendy". congrats! love the new site! Ohhhhhhh what a beautiful new look Jess! What do you mean about weird stuff and emailing you? Tres bien! The graphic is a little tall for my lil' laptop screen, but it works fabbo. What a fontastic typeface you're using there. my favorite is the little walking robot, too cute! I know I'm 'behind the times' in commenting on this, but it looks great. It reminds of those flipbooks that you make for a school project, but much more interesting. Great new design!! But I would have loved to know a little bit more of you.. Just curious! !